Marie Carson, 83 passed away Thursday, August 30, 2018. Graveside Service: 11 a.m. Saturday at Greenwood Memorial Park, Dr. Bob Mayberry will officiate. Visitation: 6 to 8 p.m. Friday at Biggers Funeral Home. Marie was a loving wife, mother, and grandmother, as well as an accomplished seamstress, making clothes and special occasion dresses for her children. Once her children were grown, she turned her talents to helping those in the community, making garments for local children’s homes and impoverished communities around Fort Worth. Additionally, she made quilts for her family, for local pregnancy centers, lap blankets for seniors, and toys to be donated to local first responders to hand out to frightened children. 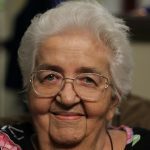 Marie was an active member of her church, who valued her relationship with the Lord. In her final days, her wish was that her life would point those around her to the Lord. Marie was preceded in death by her husband of 51 years, George. Survivors: She is survived by her sons, Clarence and his wife, Kris, and Bruce; her daughters, Loretta, and her husband, Roger, and Mary, and her husband, Kevin; her sister, Judy and husband, David; her brother, John, and his wife, Barbara; five grandchildren, and ten great grandchildren. The service will be held at the graveside in Greenwood Memorial Park. Please accept my sincere sympathy in the loss of your loved one. At a sad time as this, the Bible gives us comfort at Revelation 21:3,4 where God promises to eliminate sickness, sorrow and death. What a wonderful time when we no longer have to face these enemies. I hope this scripture gives you some consolation. Your concern and care of our needs in a difficult time were greatly appreciated. Thank you for making it possible to complete my mother’s final wishes.